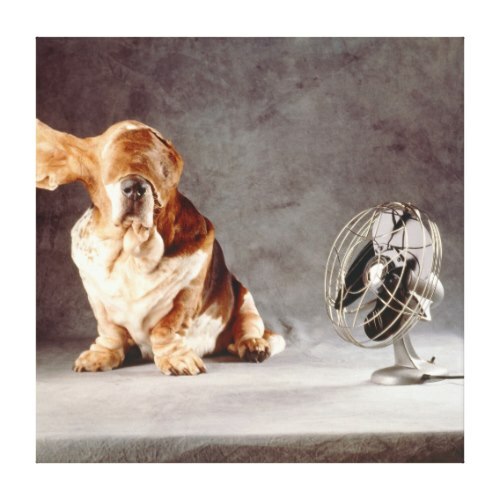 A basset hound, blinded by his ears flying in the wind..
A funny, cute, hilarious, custom wrapped canvas print, featuring a basset hound sitting with his ears, flying in one direction in the wind from a table fan, covering his eyes, while he appears confounded, even seems to be enjoying the experience. An awesome, fun, photo by Ingo Boddenberg, to bring a touch of humor to your walls, and to your living and work spaces. A fun canvas print for your den, living room, home, and office. Makes a great gift for dog lovers, pet owners, animal lovers, basset hound owners, for birthday, holidays, christmas, and more.